Vladimir Putin and Dmitry Medvedev won’t give up their hold on power in Russia for the next 10 to 15 years, as they’ve explicitly stated several times over the past three weeks. While liberals fear a new stagnation, like the one during Leonid Brezhnev’s reign in the 1970s, pragmatists argue that only a policy pursued by Putin and Medvedev in tandem can gradually turn Russia into an economically developed democracy. 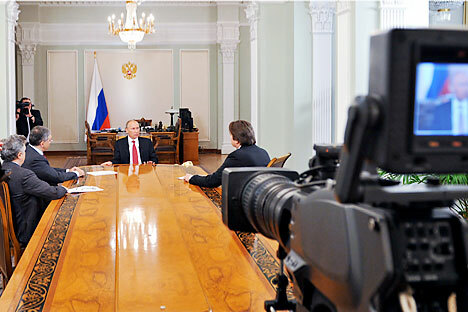 “Everything is hanging by a thread, in politics and the economy,” said Prime Minister Vladimir Putin as he warned that “two or three missteps” could quickly return Russia to a situation similar to the 1990s, when political instability resulted in armed conflicts, the economy could not function without the help of foreign loans, and Russia was on the verge of collapse. These explanations, as well as Medvedev and Putin’s intention to “swap seats,” has exasperated free-thinking Russians, who don’t want to live in an authoritarian state, but are unable to offer any alternative that would be backed by the majority. That’s why they are allegedly “voting with their feet.” Sociologists confirm that the number of Russians who want to leave the country for good keeps rising. However, this trend can hardly be viewed as political protest. The same sociologists have established that emigration from Russia today is almost always driven by economic considerations. People go abroad for money, not for democracy. According to CIA data, Russia is ranked 7th in the world in terms of GDP – but only 71st in terms of GDP per capita. Russians’ average monthly salary is just over $450. Most people have no significant savings, and their real estate assets are mostly small apartments and tiny plots of land with a shabby country cottage. Add to this misery the traditional superpower ambitions of most Russians and you’ll get an electorate voting for nationalization, for Communist-style dictatorship of the proletariat, and for the revival of the powerful Soviet Union, be it a guarantor of peace or a threat to it. Medvedev and Putin can’t help indulging those voters in their rhetoric. But their real agenda (and they keep saying that they have the same one) is as liberal as possible in the context of modern Russia. Granted, for now they are mostly talking about social and economic reforms: healthcare, education and social welfare are slowly but surely moving towards a market-based system. There has been some progress in efforts to make the law enforcement system more humane. But there is no denying it: liberalizing state government is not on the agenda. One would like to hope that the economic modernization plan that’s been conceived will help most Russians earn enough, so that they don’t think only of taking money from the rich and sharing it. Poor democracies cannot be stable. They are swept aside and replaced by cruel dictatorships. This is why there should be no rush: first we have to become a bit wealthier, and only then should we discuss deeper liberal reforms. And it would probably be wrong to chastise Jim Turley, Ernst & Young’s chairman and CEO, who flatteringly endorsed Putin’s decision to run for Russian president. Vladimir Babkin is retired deputy editor-in-chief of Russian daily "Izvestia".